What are nanostructured polymers and what applications are they used for? Coatings are very important industrial applications of materials for protecting, packaging, and labeling. It is important to develop smart coatings that go into various products that enhance performance. Bulk coatings can come in the form of paint or protective coatings. On the other hand, ultrathin or even layered coatings are important in methods for makings flexible electronics, display devices, solid state devices, and sensors. The grafting of polymers and substrates enable surface modification that allow nanostructuring based on composition and ability to stretch the chain perpendicular to the grafting substrate. Polymer brushes indicate high grafting density on surfaces, whether it is flat substrate surfaces or irregular and spherical objects. A polymer brush then has the ability to expose the end groups or modulate transport through the film. This makes them useful as barrier materials or enhancement of lubrication. They can also be designed as sensors. How are AFM used in conjunction with nanostructured polymer brushes and why is AFM an important tool for this application? There are many other methods that have been used to characterize thin films including optical microscopy, electrochemistry, optical ellipsometry, etc. However, one of the best ways of characterizing these films is through surface probe microscopy (SPM) and best exhibited by AFM with various enhanced methods. AFM is a vital tool in characterizing the morphology of these grafted polymer brushes and the use of modified techniques to enhanced surface probing. This includes surface tribology, thermal field enhancement, electrostatic chargers,etc. which can be built into the tip design or the experimental design. The use of surface probe methods enable a better understanding of the effect of polymer density on the behavior – even stimuli-responsive behavior of the brushes. How is Park Atomic Force Microscope (AFM) specifically used in this application and which features are most useful of Park AFM? Park AFM is an outstanding SPM instrument and technique (methods development) to probe polymer brushes. The XY and Z decoupling and cantilever tip positioning will enable imaging beyond that of idealized flat film surfaces. Park AFM has developed a number of tools and techniques to probe these surfaces namely> Electrostatic mode, lateral force microscopy, current sensing AFM, indentation methods, etc. to enable elucidation of structure-composition-property relationship in these films. What is a Polymer Brush? By definition, we can say that a polymer brush is a polymer chain that is tethered to a surface or interface with a sufficient surface density such that the polymer chains are forced to stretch away from the surface to avoid crowding. This can also be represented by a grafting density that is much smaller than the radius of gyration. The term polymer brush of course is analogous to a brush, a brush where you have extended bristles or chain but in this case, we’re talking about in macromolecular level. There are a number of methods for tethering polymers on surfaces. We can simply classify them as a physical or a chemical adsorption method. What we label physical adsorption means that you have an interfacial boundary where a block of polymer or surfactant is distributed between these boundaries of two faces. It can be achieved thermally or solvolytically. However, these are initially non-equilibrium phases which then equilibrate overtime. 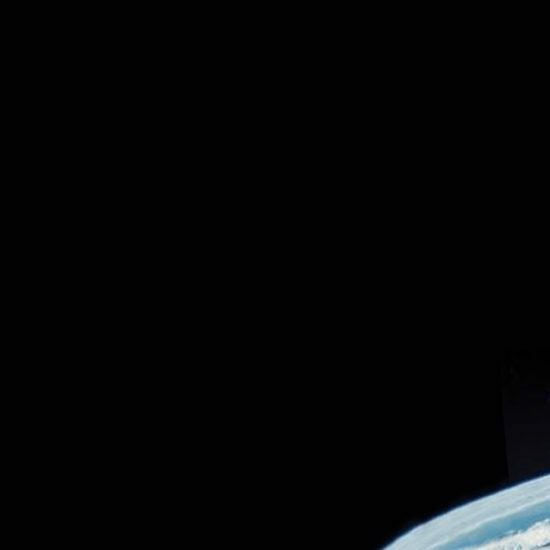 One of the consequences here is that since they are not a chemical boundary of realize that the ordering at the interface with the equilibrium, they do not easily achieve very high grafting densities. One the other hand, what we call chemical adsorption usually results in a covalent bond formation or tethering chemistry which can be achieved by let’s say silane chemistry or phosphoric acid chemistry on metals or oxides or the interaction of thiol on gold. This means the adsorption can be achieved at a boundary, a surface, or an interface where this chemical adsorption or chemical interaction takes place. Can you describe Grafting Methods for Polymer Brushes? To distinguish grafting methods based on either physisorptions and chemisorptions, we call a “grafting on to” approach where we have an existing polymer chain with a group that is chemically or physically bound to a surface. Where we do polymerization such that the initiation takes place in the bulk during polymerization, it stitches through or grafts through surface bound monomer species, there we have a “grafting through” process. However, what perhaps enables the formation of high grafting density chains better than the first two is what we call “grafting from” method or surface-initiated polymerization method. It represents a grafting as I mentioned wherein the grafting point is much less than the radius of gyration. This simply means that an initiator in an addition polymerization method typically are like free-radical, ATRP, RAFT, cationic, anionic, or metathesis polymerization originates from the surface. In other words, the initiator is bound on the surface and the monomer is limited by its diffusion to the surface. Hence, it affects the polymerization kinetics dramatically. This can be done on a flat surface, a colloidal particle surface, or other types of interfacial boundaries. What is a General Strategy for SIP? The initiator is first immobilized on the surface. After immobilization of the initiator with a specific density, then polymerization takes place. Polymerization takes place where you have the active monomer, diffusing to the surface and then as the polymer grows, there’s crowding out of the interface. One of the challenges of a grafting from technique is actually diffusion of the monomer and the crowding out of the interface or surface, sometimes leading to inefficiency or non-initiation of the surface bound initiators. Why do you use Surface Initiated Polymerization Instead Of “Grafting To”? In a “grafting onto” method, the polymer approaches from the bulk interface or solution which can be achieved by physisorption or chemisorption method of course. That means that the pre-existing polymer with its given molecular weight, polydispersity, and availability of the reactive group or physically adsorbing group has to find its way at the interface. Hence, some of the challenges of a “grafting to” approach is that of achieving of a very high grafting density. It is also of course related to the different regimes by which a polymer or a grafted polymer falls on to in its certain stages of equilibrium. Can you show how Microchemical and Lubrication Properties Are Probed By Atomic Force Microscopy? Here is one interesting example which shows that the micromechanical and lubrication properties of a surface can be changed as well by the condition as well as the patterning on a surface. What we have here is basically a polymer in which we have different charge densities and regimes. Depending on the type of solvent, it will have a variety of friction, force, properties on a surface. Dry state or swollen state for example can cause changes on the height of this polymer brushes and hence affects them of its wetting behavior. Just to emphasis this fact, let’s say, a very well known lotus effect in nature that is copied on surfaces can of course affect new wetting behavior of a tethered polymer system or the morphology of a particular thin film as well as the formation of different types of lithographically bound surfaces enhance the wetting behavior. Most of this is in fact characterized by the Cassie-Baxter phenomenon. Can you describe your work with Polymer Brushes? So back in 2006, we actually published one of the first books on grafting polymer brushes and monographs as well have appeared. This technology is about 25 years old in terms of its potential uses in fields like electronic devices, wetting, packaging, and biomedical applications. What I would like to emphasize are some of the chemistries that we’ve developed through the years involving that of polymer brushes based on surfaces. We are one of the first to pioneer what we call anionic polymerization on surfaces. We call this the LASIP technique. One technique that we use involves the tethering of diphenylethylene co-initiators which were then activated by n-Butyllithium. The anionic anion generated allows us to, for example, polymerized thyrine or even form a block of polymer brush with isoprene. Hence, in a classical anionic polymerization which is done in solution, we’re able to do it on surfaces, and in this case, a modified bulk surface with a diphenylethylene co-initiator. Some of these early works resulted in the following. We were able to control the grafting of these polymers actually on silicon wafer and bulk surfaces as well. This was done by using n-Butyllithium on the diphenylethylene initiator and for example, the left AFM picture shows the graphic on a silicon wafer surface and the right one on a gold-coated wafer, which actually showed a thicker brush of about 23 nm versus 13.7 nm. We were able to graft polystyrene and then followed by a grafting of isoprene. This is a living anionic polymerization, after depleting all the styrene monomers, we simply add in the isoprene monomer to produce these block copolymers not only with isoprene, we were able to achieve this with blocks of polystyrene and polyethylene oxide and polyisoprene and PMMA. What are the General Stages of SIP on Particles? Particle polymerization simply means that the grafting is done again by tethering the initiator on the particle with a number of strategies outlined earlier, chemisorption or even physisorption, and then followed by the polymerization in the particle. What happens is we achieve a core-shell geometry where the core is the particle substrate and the shell is the grafted polymer brush. What we would do in a typical procedure is actually through a characterized the grafted polymer using SEC. For example, if we use silica particle as a substrate, we would then mix it with potassium hydroxide, alcohol to remove the bulk polymer. The bulk polymer can then be characterized normally by GPC. What we found actually on this LASIP procedure is that we were able to get a good correspondence of the monomer styrene feed ratio with the molecular weight of the polymer, hence, we actually achieve here a type of living polymerization. However, not the exact monomer feed ratio but in terms of the linearity of the process, it is well taken. We have also done this on clay nanoparticles. We modified clay with a cationic diphenylethylene initiator, activated with n-Butyllithium. What’s interesting with clay is that of course it is hydroscopic and therefore, by heating it up and drying it a 120° C which is a very important procedure, we were able to do anionic polymerization on clay with that cationic bond surface initiator. Characterization can be done by infrared spectroscopy both for the polymer bound on the clay or separate it from the polymer after they’re grafted. Interestingly, since the polymerization is followed by the intercalation and delamination of the clay platelets, then we can also observe the changes that are happening on this space in between each of those clay platelets by x-ay diffraction. What are Nanostructured Layer-by-layer Self-assembly? The use of polyelectrolytes to modify surfaces with charge particles or polyelectrolytes can be achieved by alternating the deposition of let’s say a negatively charged polyelectrolyte and a positively charged polyelectrolytes. This can be done on a flat surface or a particle surface. You can achieve in fact, a hollow shell configuration by removing the particle. This has been done by many, many groups through the years and demonstrated in particles and surface substrates as well. We have done a lot of work in this field through the years. How are Polymer Brushes used for Application in PLEDs? It is interesting to point out the use of Polymer brushes as applied to solid state devices and polymer brushes patterned on interfaces using colloids and polymer grafting methods. 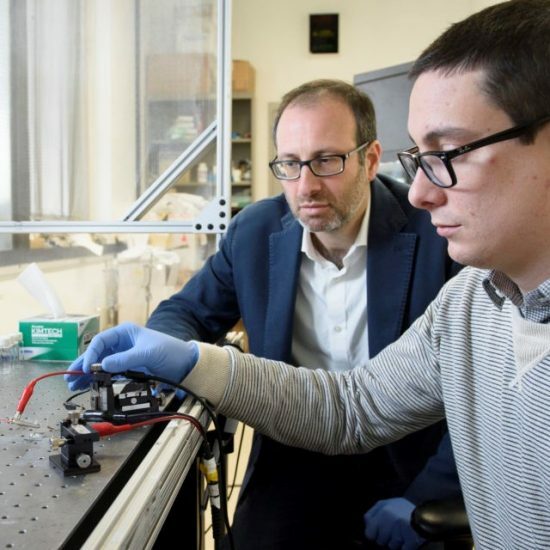 One of the interesting things with solid state devices is trying to play an important role of the cold transport or even electrode transport in devices such as LED and photovoltaic devices. Polymers play a very important role whether it’s the active material or the passive material. Another interesting area is the patterning, specifically Electrochemically Grafted Macroinitiators and Conducting Polymer Films. In the webinar, I give many examples of this including the technique of electropolymerization to graft a RAFT (reversible addition-fragmentation chain transfer) initiator on a conducting surface, Electropatterning of Binary Polymer Brushes by Surface-initiated RAFT and ATRP, Fabrication of Patterned Binary Brushes of PS and PNIPAM, FT-IR Imaging of PS-PNIPAM Patterned Brush and Patterned Surfaces Combining Polymer Brushes and Conducting Polymer via Colloidal Template Electropolymerization. We have also patterned polymer brushes using colloidal templates. Back in 2011, we demonstrated that colloidal particles can be used to patterned surfaces where the colloidal particles can form a hexagonally patch structure as shown here. The interstitial spaces provides a way for electrodeposition let’s say a conducting polymer to be made on the electrode surface. Hence, by masking or using this as templates, one can observe the formation of arrays as shown here. These arrays are conducting polymers that were deposited at the interstitial spaces in between those of the particles resulting in a honeycomb, half comb, or full dome structure as shown here. In fact, they can be harvested even as particles. Please explain Electro-Patterned Polymer Brushes via Electrodeposited ATRP Initiator and Colloidal Templating. We can actually grow the polymer brush along the arrays. In this case, after electrodepositing this macroinitiator of the surface, the colloidal particles were then removed revealing a macroinitiator surface and then growing the polymer brush. We were able to demonstrate this with an ATRP, RAFT and a metathesis system. Just to show you all three, we were able to do the grafted polymer system. You can see the change in morphology by AFM as we grow the polymer brushes along the ridges of the patterned array, not in the hole. On the other hand, since we are able to do modify the hole with an initiator for ATRP, we can do a dual or binary composition in which the arrays are modified with a polymer brush, but then we can also modify the holes with another polymer brush having a binary composition. In fact, we were able to characterize this place on the diffusion properties of let’s say a molecular ion probe using cyclic voltammetry as a method to look at the diffusion of polymers on a conducting substrate. 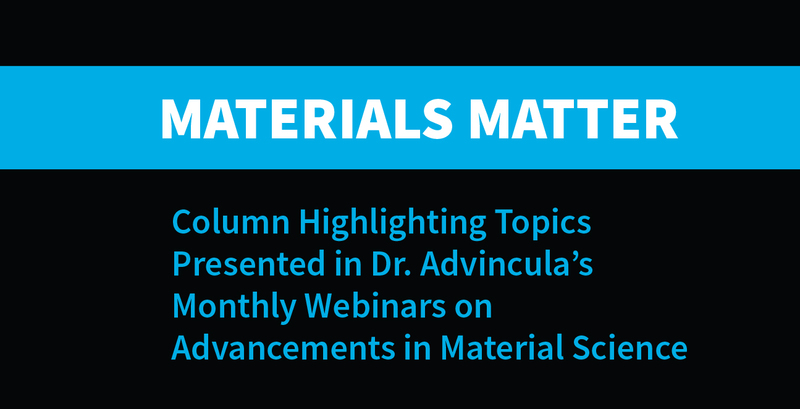 Beginning on Jan. 16, 2019, Park Systems began offering a new free webinar series titled “Materials Matter” by Dr. Rigoberto Advincula, Professor, Department of Macromolecular Science and Engineering at Case Western Reserve University and editor-in-chief of MRS Communications, Materials Research Society. A new webinar covering leading edge developments in Materials Science Research and applications using AFM will be presented every third Wed of the month at 12pm EST for the entire year. Each issue of NanoScientific will offer a column highlighting one of the lectures. 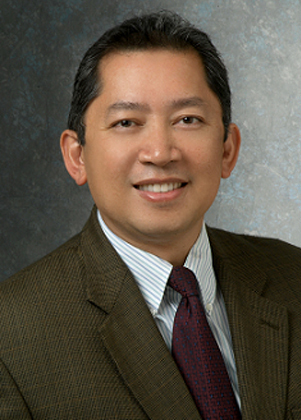 Dr. Advincula is a professor of Macromolecular Science and Engineering at Case Western Reserve University and Editor-in-Chief at MRS Communications. He’s a Fellow of the American Chemical Society and a Humboldt Fellow among many other professional awards, published more than 250 peer-reviewed publications, and a particular note for today’s topic is the co-editor of the book “Polymer Brushes, Synthesis Characterization and Applications”.